Q. What’s the best way to repair dry wall tape that is coming loose on sprayed ceiling joints? A. The biggest place that tape joints usually fail on drywall ceilings is along the edges where pieces of sheet rock meet at 90 degree angles, or at some other intersection. When this happens, you need to remove all of the offending tape (in some instances, if you are lucky, you may be able to cut the buckled tape with a razor knife and then smooth over the area with drywall compound). Thereafter, you will need to mud the area where the removed tape was previously and take care of any drywall imperfections that would still be noticeable after the tape was installed. Further, the underlying compound forms the base for adhesion so that the tape does not come loose – repeating the issue you have at hand. Thereafter, you will need to float out, smooth down, let dry, and sand the compound until it is smooth. If you are going back with popcorn texture on your ceiling, you may not have to do a whole lot of sanding because the surface of the tape will be covered. In some instances, however, you may have half of your tape on a smooth vertical wall and the other half on a textured ceiling perpendicular to the floor. In this case you will want to make sure that the portion adjoining the wall is smooth in appearance. At this point, you will need to either a) get a compressor, popcorn hopper, popcorn aggregate that matches your ceiling, drywall mud (20 min 45 min, or regular depending on the size of the job) and texture over the area or b) use a can of compressed air popcorn texture (I am not a big fan of this because of the way the finished product often looks, but sometimes it is a good fit for a very small issue). You will need to cover all items below as this is a messy process. You will also want to tape and plastic off the wall from the ceiling. Because you have removed the tape form the wall, you will likely also have to paint that wall from corner to corner – particularly if your paint is of an egg shell or semi-gloss sheen. Often, tape joints come loose because the drywall underneath is not fastened to the stud framing appropriately. So, make sure this is not the case. Repairing the tape joint will serve no purpose if the underlying drywall repair is not completed satisfactorily. 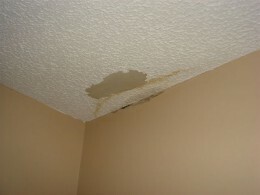 Finally, the finished product with popcorn ceiling repair can often be noticeable no matter the skill of the tradesmen. Whether popcorn ceilings were installed 50 or 5 years ago, there are a lot of variations in their application. Who applied the texture, how they applied it, with what machine was it applied, what popcorn aggregate was used, and the mixture of drywall compound can all make a difference in popcorn or knock-down ceilings looking consistent after a repair. Popcorn ceilings are like snowflakes, every texture pattern is slightly different, and that’s why it’s important to have a trained professional execute your work if you are particular about its appearance and not especially skilled in ceiling repair work. If you need an interior drywall repair estimate, feel free to call Painter Ready at 648-4408, or simply use our online estimate request form. Painter Ready professionally performs a wide array of coatings, pressure washing, and simple carpentry services for customers in TN and GA, including Signal Mountain, Hixson, Cleveland, Soddy Daisy, Lookout Mountain, Powder Springs, Ringgold, Rossville, East Ridge, McDonald, Ooltewah, Harrison, Sale Creek, Apison, Dayton, Chickamauga, and Lafayette.